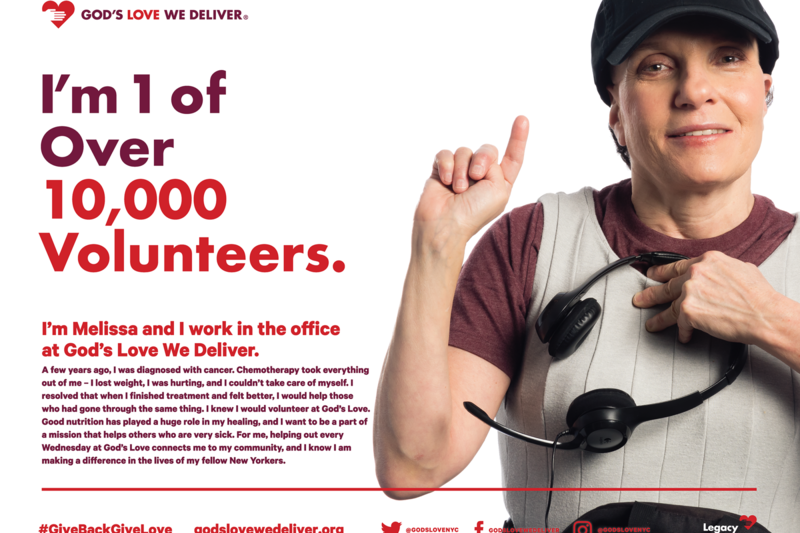 Our Volunteers are 10,000 Strong! During National Volunteer Week, it is our great pleasure to recognize and thank our wonderful volunteers. Their work is truly exceptional, and they are integral to everything we do at God’s Love We Deliver. Without our volunteers, we simply would not be able to cook and deliver meals to thousands of our neighbors in need. For more than three decades, God’s Love has been providing the medically tailored, nutritious meals that our clients so urgently require. From the very beginning, we recognized the force of the tremendous heart of our volunteers, and today, we are proud and humbled to work with more than 10,000 individuals who give their time and talent to God’s Love every year. 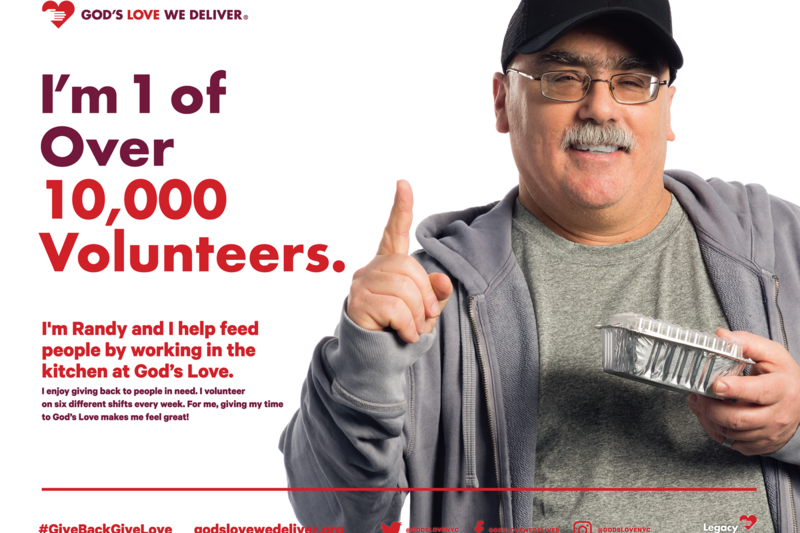 This year, to honor our volunteers, we are excited to launch our new campaign: “1 of Over 10,000 Volunteers.” The campaign celebrates each and every one of our 10,000 volunteers for their unique contributions to God’s Love. Join us in using the hashtag #GiveBackGiveLove on social media to underscore the love our clients feel from our community of volunteers who are giving back, and giving love, with every hour they spend with God’s Love. 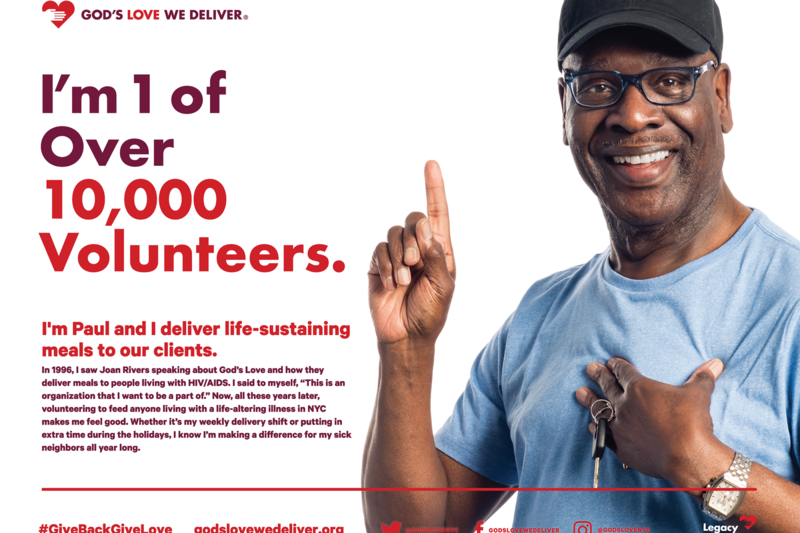 You will see our volunteer campaign billboards at the Spring Street subway station (6th & Spring) at God’s Love and at the Number 1 subway station at Houston Street. They feature some of our fantastic volunteers. 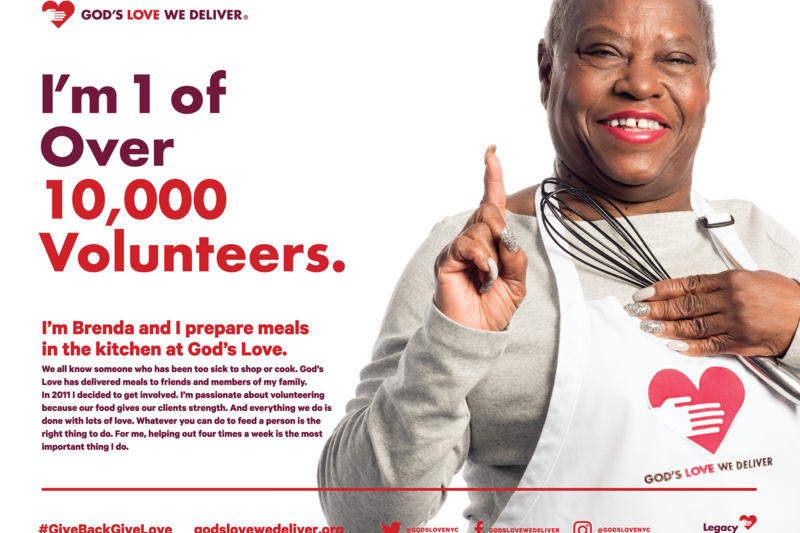 For more than three decades, God’s Love We Deliver has been providing the medically tailored, nutritious meals that our clients so urgently require. 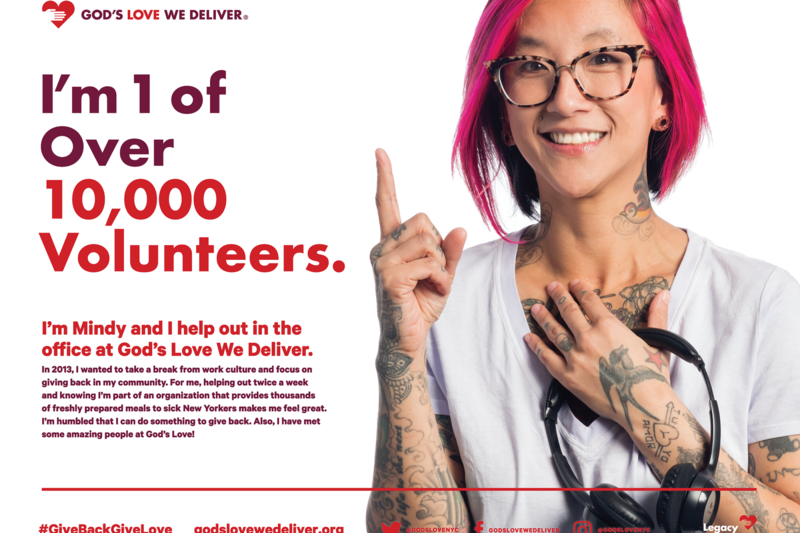 From the very beginning, we recognized the force of the tremendous heart of our volunteers, and today, we are proud and humbled to have the help of more than 10,000 individuals who give their time and talent to God’s Love every year. Some volunteers have been with us since day one; other volunteers are just getting started. We have entire families who volunteer together, and still others who come on a corporate service day. Each of their stories is 1 in 10,000. Every single volunteer at God’s Love had a hand in accomplishing these extraordinary milestones. Today and every day we honor our volunteers and thank them for their extraordinary service and dedication. Their engagement and commitment are unparalleled. We are grateful for their gifts of time and heart. We thank them for choosing to make God’s Love a part of their lives, and for making our life-saving services possible. Thank you to our volunteers for helping to change the lives of our sick neighbors.